The 58 pattern webbing set had a number of different water bottles and associated carriers over the years. The initial pre-production bottles were square in profile and although these were replaced with the familiar Osprey design before large scale production, these early production bottles were made of green rather than the more familiar black plastic. The carrier itself was also modified. The early design was too small to allow the bottle to be easily removed and fastened with a turn-button. 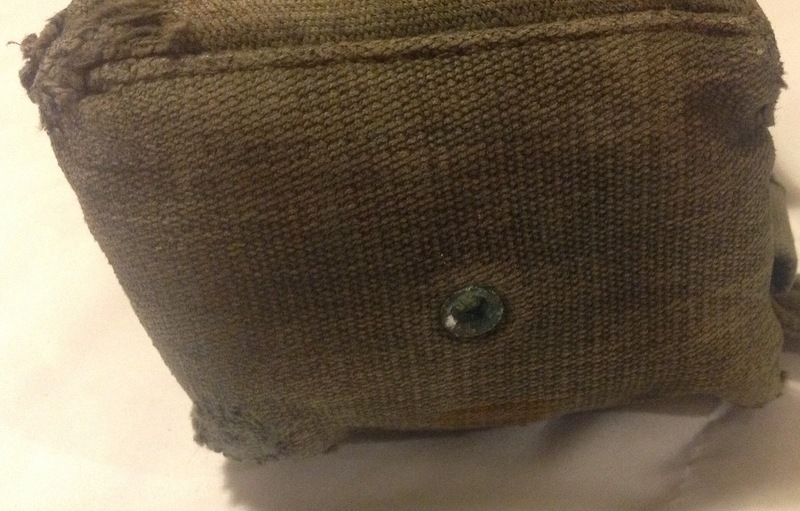 This was replaced with a revised pouch that was a little larger and had a different method of fastening the top flap. 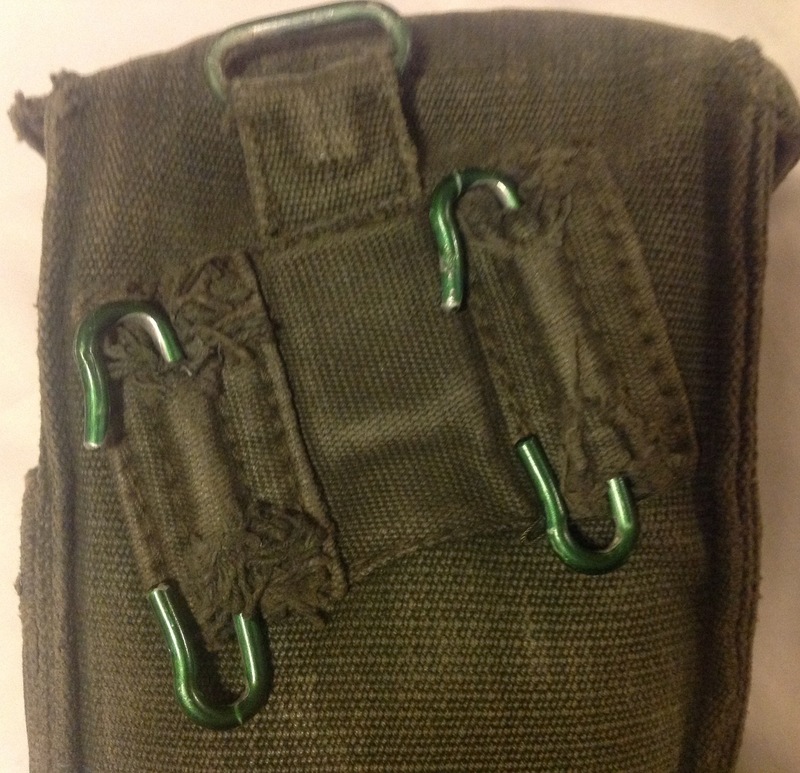 The pouch is made from a lightweight dark green cotton webbing: The turn buckle was replaced with a strap and blackened metal buckle to hold the top flap down: The underside of the lid has a small pocket sewn to it that can hold a set of water purifying tabs: The pouch is a snug fit for the water bottle and cup, but it does slide in and out easily enough: This pouch is in unissued condition, without a single scratch to the buckles or any storage dirt whatsoever, as can be seen most clearly on the rear: The back of the pouch has a pair of ‘C’ hooks to secure it to the 58 pattern webbing belt: And the maker’s details, stores code and date are stamped on in a large ink stamp: These water bottle pouches were put to far more uses than just carrying a water bottle and examples were added to the 58 pattern set as utility pouches. Other uses saw them marked up with a red cross and used for first aid kits, their slim width making it easier to add them as extras onto a standard webbing load out. This entry was posted in 58-Webbing, British Army, Post WW2 on November 12, 2018 by hatchfive. When it was first introduced the 58 pattern webbing set did not include any of the pieces of webbing usually used by officers, so there was initially no binocular cases, holsters or compass pouches. It was quickly realised that these were essential components for any equipment set and by the early 1960s these pieces had been introduced, although they do not appear in the fitting instructions for the 58 pattern set. Tonight we are looking at the compass pouch from this set which accompanies the pistol and binoculars cases I already have nicely. The case is a small square pouch in the green pre-shrunk cotton typical of the 58 pattern set: It is more square in shape than earlier designs and the box lid secures with a brass turn buckle rather than a press stud: The lid opens to allow a marching compass to be fitted inside: The interior of the pouch is padded with felt to help protect the slightly delicate compass from shocks and bumps: Manufacturer’s details were printed on the underside of the box lid, unfortunately in this case they are now very faint and I can’t make out who made this pouch or when: The rear of the pouch has a single metal ‘C’ hook and a transverse webbing loop to allow the 58 pattern yoke to be slotted through: For some reason, this pouch has had a splash of yellow paint added to the rear: I am not sure exactly why this has been done, possibly it has been added by a previous user so he can quickly identify his piece of webbing in a pile of his comrades. 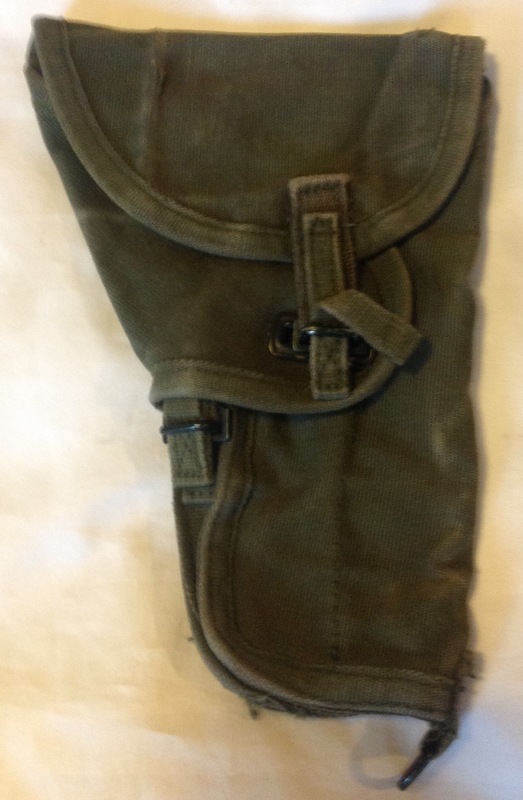 As items like the binoculars case, holster and compass pouch were produced in smaller numbers than the standard infantry 58 pattern webbing, they are slightly harder to find today than other components. Having said that, they are still out there and careful shopping will allow the collector to find them at a reasonable price. I paid £5 for this case and the dealer I bought it off had three of them for that price so they are still readily available. This entry was posted in 58-Webbing, British Army, Post WW2, Webbing on July 9, 2018 by hatchfive. 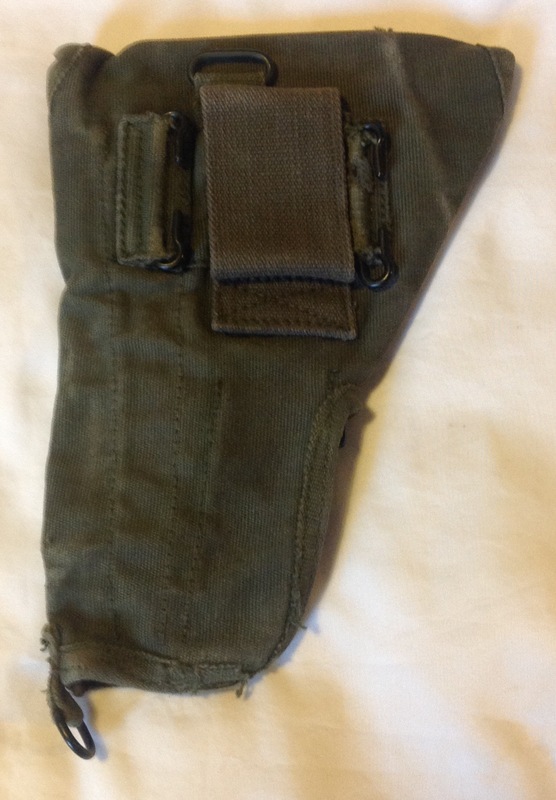 A few weeks ago we looked at an altimeter pouch that had been designed for use by the SAS. There were a number of different pieces of specialist 58 pattern webbing produced for Britain’s special forces and tonight we are looking at another example. 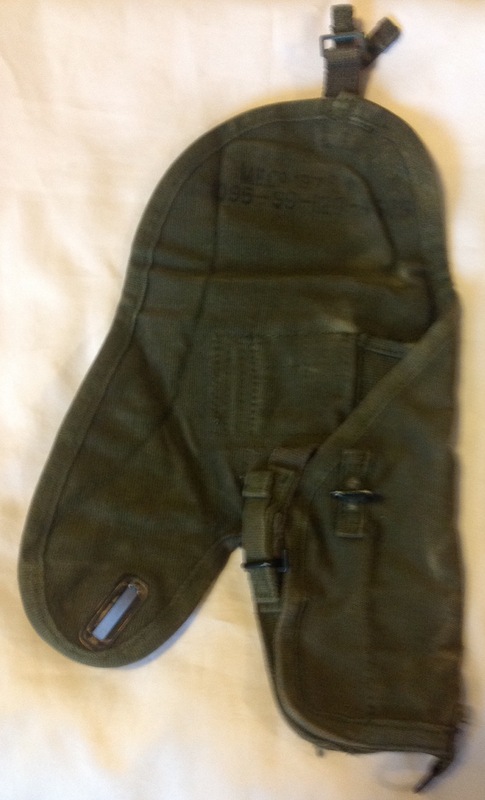 The 58 pattern yoke was a comfortable piece of equipment that was well padded and generally well liked by troops. 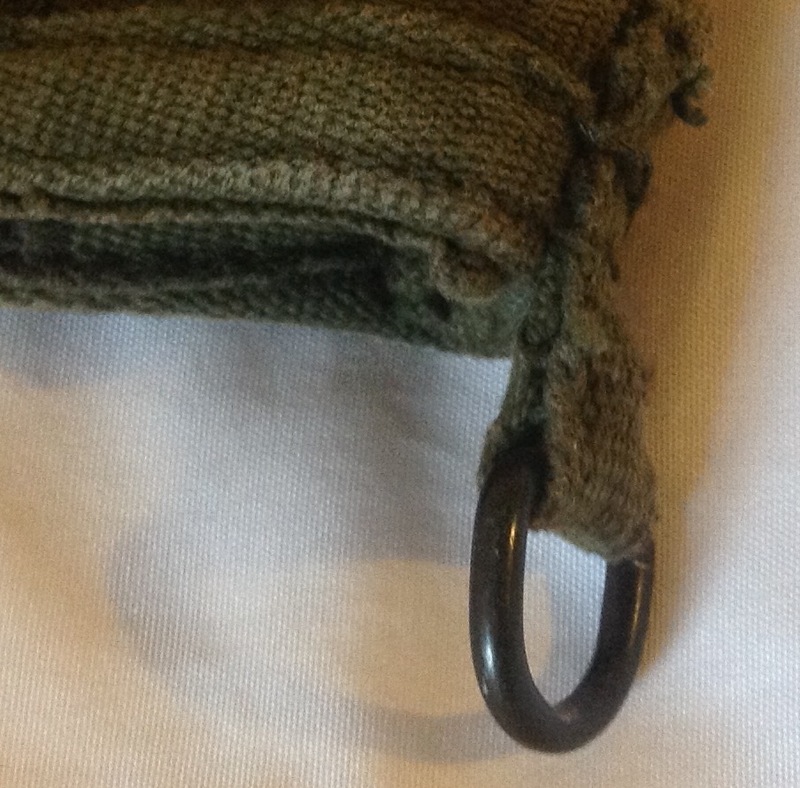 It was not however designed to be worn with the large A Frame bergans popularly used by members of the SAS. 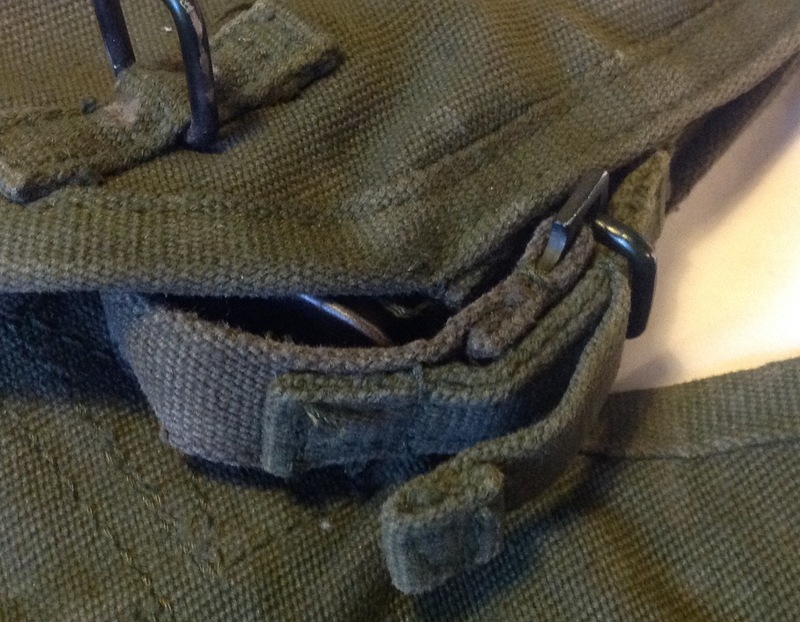 The thick padding was uncomfortable under the bergan and the metal stud for attaching a pick axe helve interfered with the fit of the metal frame. Early modifications to the 58 pattern yoke included removing this metal stud which helped to some degree, but in the end a dedicated pair of shoulder braces were introduced to be used by the SAS and it is one of these we are looking at tonight: The shoulder brace is quite reminiscent of a 37 pattern strap, with a wider portion 2” wide in the centre where it passes over the shoulder, thinning to 1” at each end of the brace. As the 58 pattern belt was never designed for use with traditional shoulder straps, simple loops are fitted to pass a belt through. 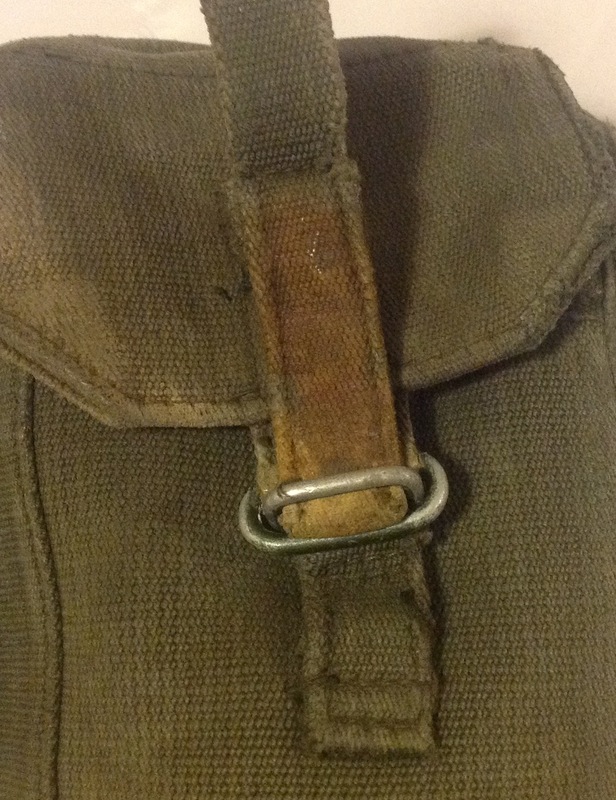 At the fixed end of the strap there are two of these, one above the other: The opposite end of the strap is plain and a separate loop with a buckle is provided to go over the belt: The plain end of the shoulder brace goes through this buckle and allows the length to be adjusted easily for comfort. 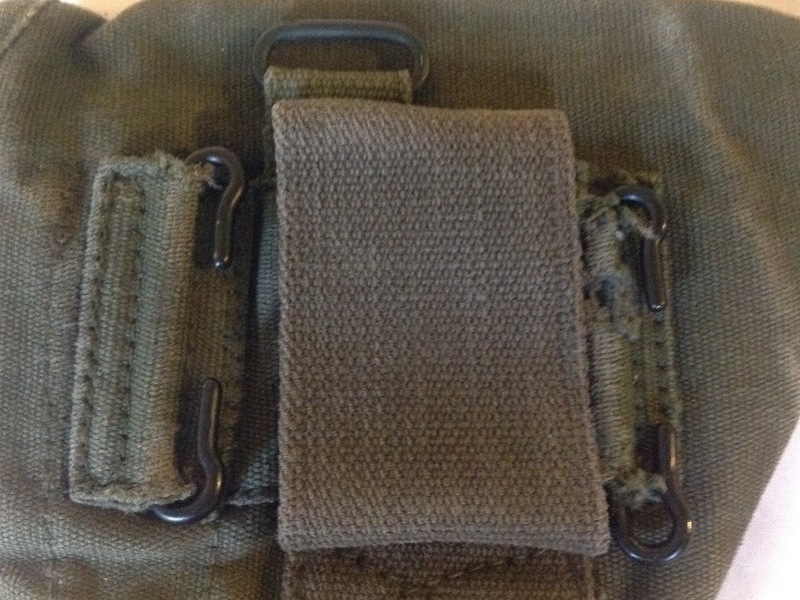 The strap is an official piece of webbing rather than a piece made at unit level. The straps had an NSN number of 8465-99-130-0246 and this was stamped on the strap, although it is very faint on this example: The straps came as a pair, one plain like this one and a second with a loop on the back to allow the straps to be worn crossed. Sadly I don’t have a complete pair yet, but like any SAS related equipment this strap is quite scarce and commands high prices on the collectors market. The prices for SAS related objects often have as much to do with the cache of the Regiment than any actual relationship to their scarcity. Often far rarer items sell for much less because they do not have the association with Special Forces. Happily for me, this strap came as part of a general job lot and was a pleasant surprise when I finally managed to identify what it was for! This entry was posted in 58-Webbing, Post WW2, Webbing on July 6, 2018 by hatchfive. In the late 1960s a number of new items of webbing were quietly added to the stores catalogue to go with the 58 pattern web set. These were items for use by the SAS and were pieces of equipment that were felt to be useful based on operational experience and some experiments in unit with producing similar pieces of equipment unofficially. 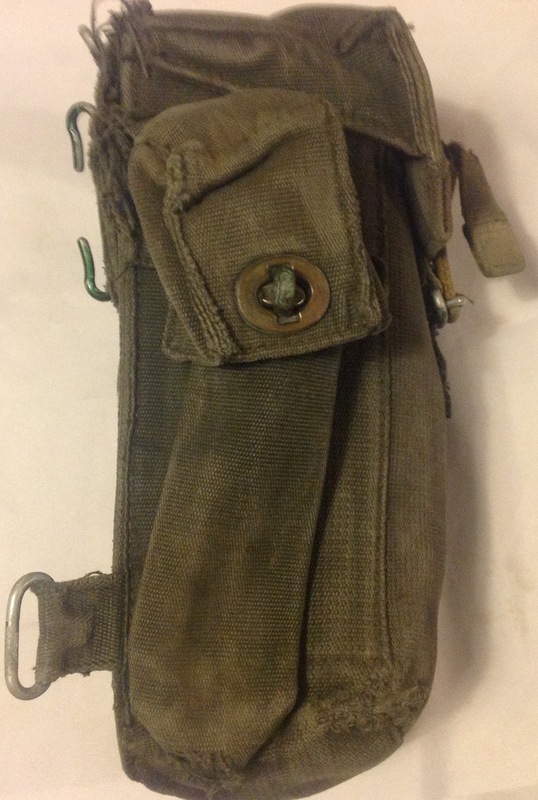 None of these items of SAS webbing are easy to find now, however the most common piece to come across today is the altimeter pouch. 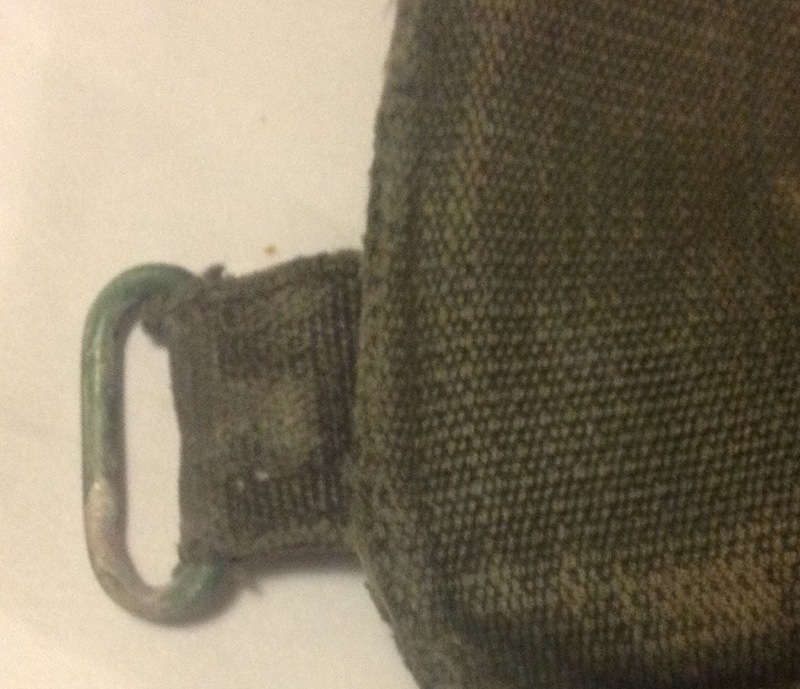 The altimeter pouch is a small green webbing pouch for carrying an altimeter, the SAS had been operating in jungled mountainous terrain in Indonesia and Borneo and an altimeter was very helpful in determining a troopers height in this rugged landscape and how far up a particular mountain they had actually gone. The altimeter was small and round, so the pouch was shaped accordingly: A box lid fits over the altimeter and is secured with a single press stud, keeping the contents safe and secure within: Due to the size of the pouch it was impractical to have it mounted on the belt itself, so a pair of one inch drop straps allow it to hang below the waist belt: The large eyelet is to allow a lanyard to be fastened, securing the altimeter to the pouch and preventing it being dropped and lost. 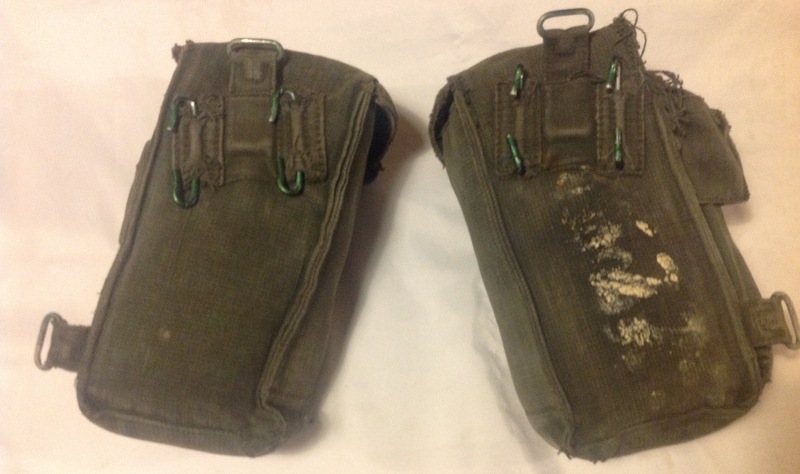 Underneath is the faint markings of a stores code and date, it seems to have been made by MW&S in 1982: I have struggled to find much further information on the pouch, presumably due to the secretive nature of special forces there is not much out there on the pouch. I did however come across this photograph which I believe is a 1980s photograph of an SAS belt kit set up (the site I found it on is in Polish so I have no context I can give to the image). Here the altimeter pouch can be seen on the belt, but it is being used to carry a compass: If anyone has any pictures of the actual altimeters used with this pouch, please get in contact as it would be interesting to see what is supposed to fit inside the pouch! This entry was posted in 58-Webbing, British Army, Post WW2, Webbing on June 18, 2018 by hatchfive. 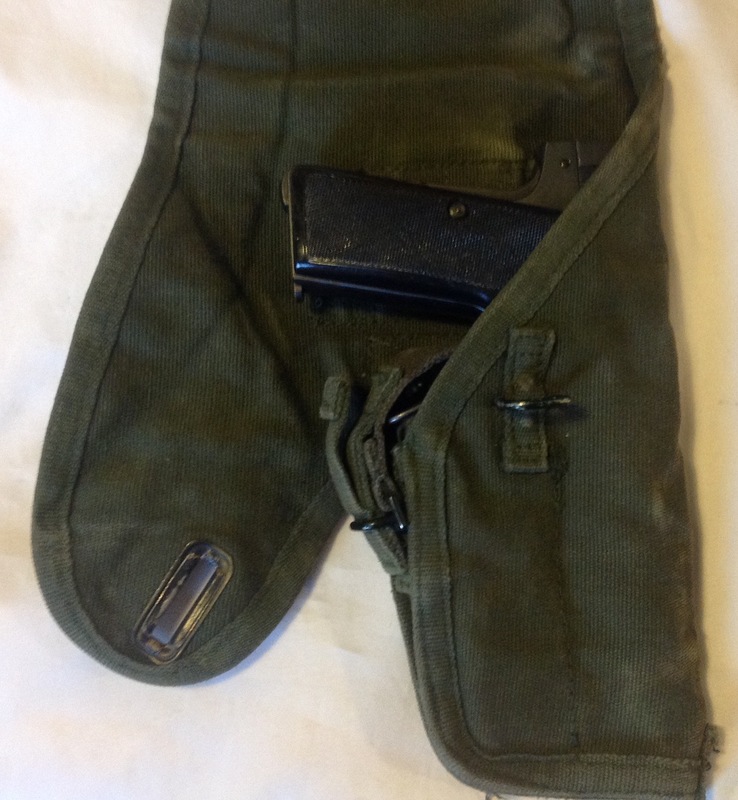 The holster may either be clipped to the belt by two ‘C’ hooks, or it may be attached to a leg strap by means of a webbing loop sewn between the ‘C’ hooks. 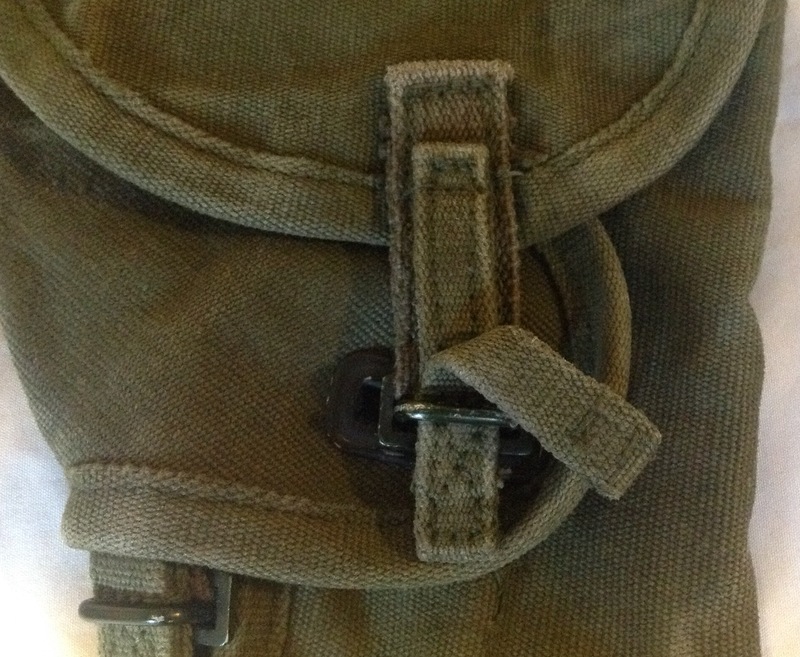 A link similar to that on the ammunition pouches provides anchorages for the front yoke straps. A ‘D’ ring at the bottom enables the holster to be anchored, if required, to the cape carrier or to the main pack, to prevent the holster from swinging and chafing the legs. 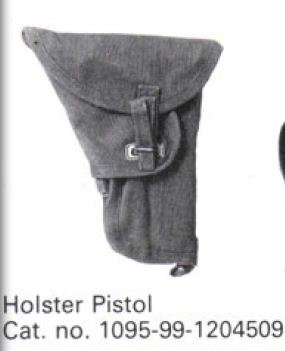 MECo were not the only manufacturer of 58 pattern webbing, and this illustration comes from the webbing catalogue of M Wright & Co: Not only was the holster produced in the standard green seen here, but white examples for military police and blue grey RAF examples were produced, albeit in much smaller quantities. This entry was posted in 58-Webbing, Post WW2, Weapons, Webbing on May 5, 2017 by hatchfive. 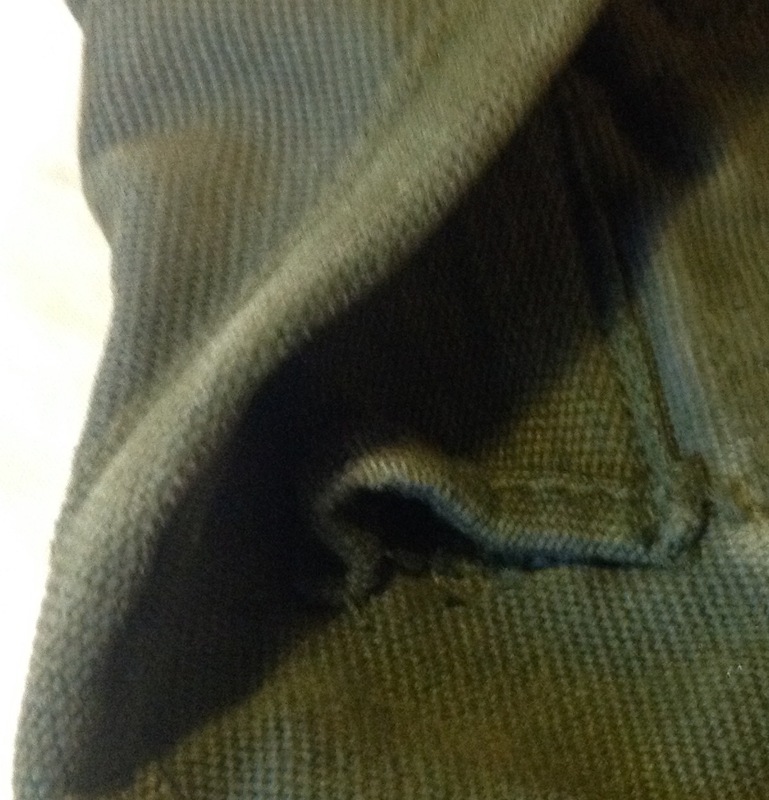 This is approximately 10 inches deep, and 4 ½ inches wide with 2 ¼ inch gussets. It is closed with a ‘box’ lid having a quick-release fastening. 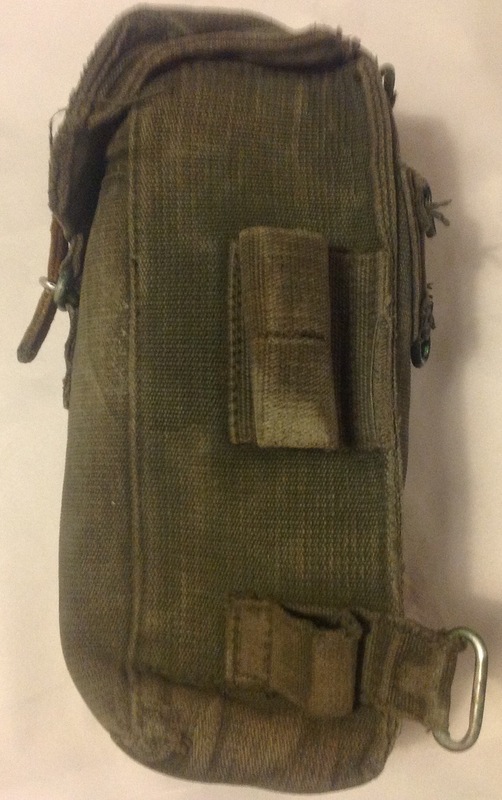 This pouch is similar to the pouch, ammunition, left, excepting that is has an external pocket on one side instead of the bayonet scabbard loops. 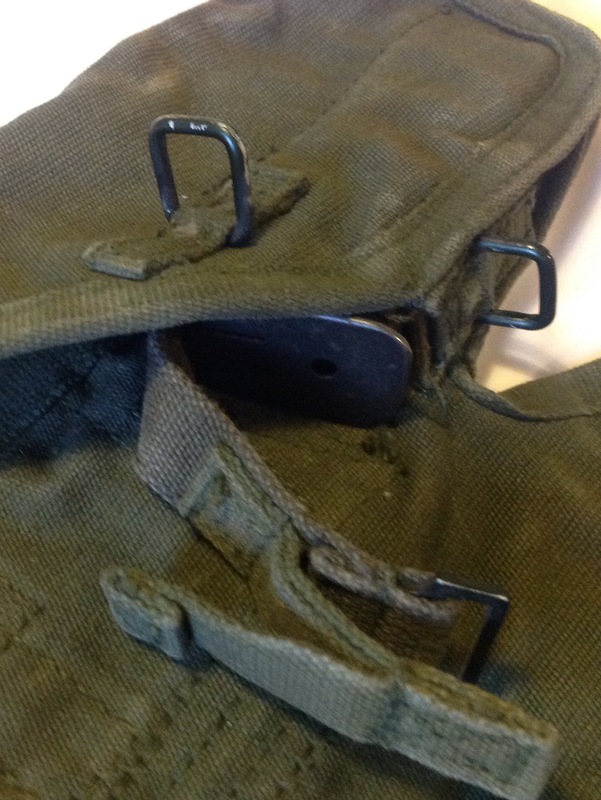 This pocket is for a grenade launcher or a 1 inch signal discharger and is closed by a hooded flap with a turn button closure: Thie pouch was designed for the Energa launcher, but was usually used for knife, fork and spoon in later years. Turning the pouches over we can clearly see the angled ‘c’ hooks on the back: Another point to note is the usual metal grommet in the base of each pouch to let the water run off: I apologise for the ‘salty’ nature of these pouches- I do have better examples but they are built up into webbing sets. 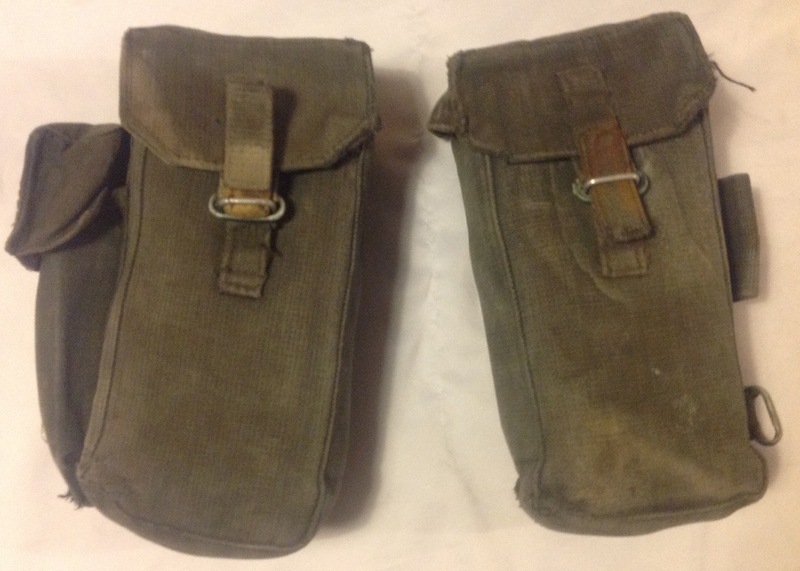 The condition of these pouches though is not untypical as these webbing sets were used heavily first by the army, and then even after the introduction of PLCE by the reservists and cadet units. The cotton webbing is not as durable as some more modern materials and hence some of these pouches can get pretty worn and ratty. This entry was posted in 58-Webbing, British Army, Post WW2, Webbing on November 19, 2016 by hatchfive.